Blackmon. Also on exhibit, is a selection of new color works by John Chervinsky from his series “Studio Physics.” An engineer working in applied physics, Chervinsky's photographic work is an investigation into the nature of time, light, space and gravity. 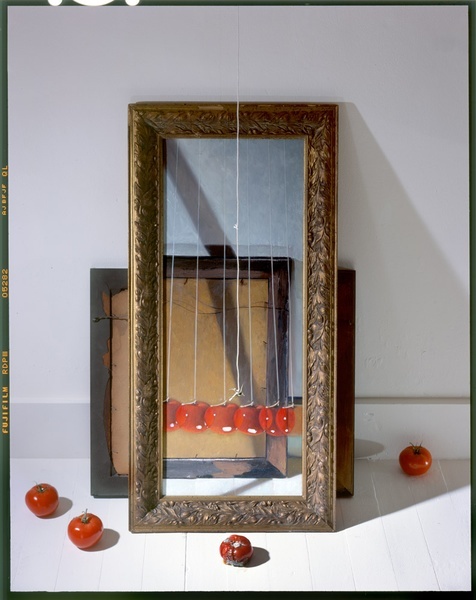 In honor of Chervinksky’s exhibit at photo-eye he has agreed to tell us a little more about the making of one of his images - Tomatoes, Painting Against Wall, 2012. 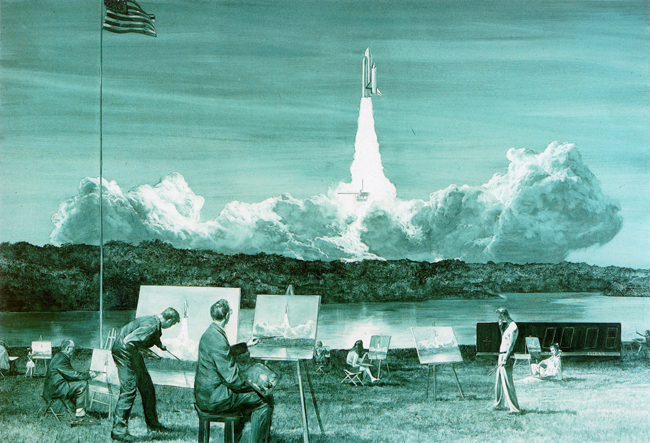 There is a great, large-scale, Mark Tansey Action Painting in the Montreal Museum of Fine Arts that depicts the launching of the Space Shuttle, while a group of painters dutifully attempt to capture the unfolding of events en plein air, as the shuttle zooms toward the sky. I love the absurdity of this work of art and that it made me wonder how artists may have perceived the world in motion before photography. With that thought in mind, I set out to make a photograph of a painting that could not have been made before Muybridge or Edgerton. The setup started off with a fresh tomato suspended by a string in front of an empty picture frame. Behind that picture frame was a framed vintage photograph facing the wall. It was included to provide a dark background for the tomato. The shadow of the frame itself falls upon the wall and the back of the framed photo. A 4x5 Graflex, Crown Graphic press camera, equipped with a 210mm Schneider lens, was used to make the photograph. I use Fuji Instant color film for proofing. This particular setup is illuminated by two laboratory grade stroboscopes made by General Radio. These repeating strobes are capable of producing flash durations as fast as 100 nanoseconds and are therefore capable of freezing a moving bullet. They are however, very directional and not typically intended to light a scene. I solved that problem by using consumer grade fluorescent light diffusers that I obtained from the hardware store. Eventually I made a stroboscopic photograph depicting the motion of tomato as pendulum onto transparency film. I scanned and cropped that image to the inside of the picture frame and emailed a jpeg of it to a painting factory in China. I asked them to send pictures of this painting as it was being produced, figuring that I could influence its direction. Instead, they sent an image of the completed painting along with a series illustrating its progress after the painting was completed. Still, I felt very lucky that they did so at all, as any extra requests or questions that go beyond a business interaction, are usually met with silence. It typically takes around two weeks to produce such a painting and another week to ship it from China. Meanwhile, back in my studio, the now still tomato was starting to rot. When I first received the painting and inserted it into my setup, the tomato was still suspended from the string but it now appeared as a distracting element in front of the painting. This posed a bit of a dilemma, as I did not want to remove it because the photograph would not make sense without it. It turns out that all I had to do was wait, as the rotting stem eventually let go and dropped the tomato in a most fortuitous place in the image. I fortified the final setup with fresh tomatoes and moved things around a little to make the composition more interesting. The final image was shot onto Fuji Provia, scanned and printed with an Epson 7800 onto Canson Rag Photographique paper. For more information on John Chervinsky's photographs, please contact Anne Kelly at photo-eye Gallery by email or by calling (505) 988-5152 x202.